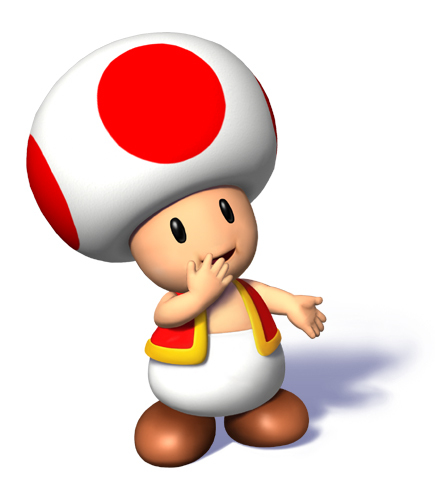 have you ever wondered about toads hat? i mean what is it? is it made of mushrooms or cloth or what? Re: What is Toads hat? It's probably made of a mushroom cap. I'm guessing he somehow is an evolved form of a fungi. But in the first episode of the Super Mario Bros. Super Show, he uses his hat as a parachute, assuming it's cloth. In other episodes, after Toad has been swimming, he squishes his hat to let all the water out. This also points toward the conclusion that his hat is indeed cloth. Though in Super Mario Galaxy, you can jump on his head, and it's bouncy like a mushroom. This is a tough one. It's probably one of the 7 Wonders of the Mushroom Kingdom. That picture looks like claymation, I think it is. The Super Mario Brothers Super Show isn't canon, though.